Musical icon Sahra Halgan was one of the many people who fled Somaliland after the brutal Siad Barre regime, which left the self-declared country in ruins. The capital, Hargeisa, was turned to rubble, with many public services and utilities destroyed. During the Somali conflict in the late 80s and early 90s, Halgan worked as a nurse, but was always passionate about music. "We didn't have medicine, painkillers or antibiotics. We had nothing. I would sing and my songs would be the painkiller," she told CNN. She would sing songs that embodied the spirit of the Somali National Movement (SNM), who sought to overthrow the Barre regime and became famous for her songs about Somaliland gaining recognition as an independent state.Halgan left Somaliland in 1991, resettling in France. She never thought she'd return, but feared that like so much else, the rich culture of her country would become another casualty of war. "I wanted to create something for the arts because they had nothing here - so that's exactly what I did," she said. Halgan opened the "Hiddo-Dhowr" center for arts and culture in 2013, a one of a kind music venue in Somaliland. "All the young people in Somaliland used to want to go to Europe because there was nothing for them here," she continues. "But now the center of culture gives them a place to socialise, sing and even dance." "Hiddo-Dhowr" is designed in the style of traditional Somali houses and is a space for poets, artists and musicians. Sahra opened the center with financial help from the Somaliland Business Fund, part of the World Bank and it employs over 20 people.Music is still an integral part of her life and she is using it as a tool to bring attention to a cause that is still dear to her: statehood recognition for Somaliland. Despite 26 years of peace since declaring independence from Somalia in 1991, not a single country has recognized its statehood. Through her music and her outspoken views on the state of the country, Halgan hopes to change this. 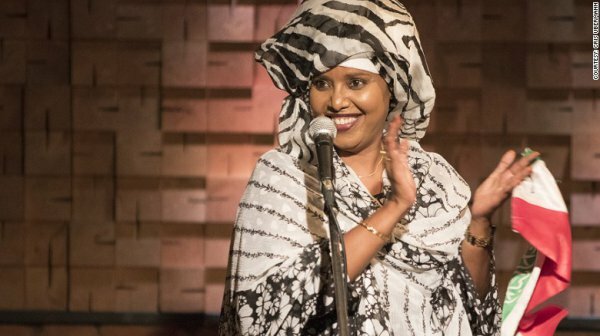 With her band she highlights the fight and struggle for recognition to audiences all over the world.Halgan's tenacity on stage and her courage to speak her mind off it have made her a superstar in Somaliland - a country where thousands are suffering from drought and famine. But despite Somaliland's challenges, she is hopeful that the future is bright. "The future will be better. One day we will have recognition," she said. "We won't ever give up,"